Alaskim | Surviving Wildlife, Wildflowers & Wild-Haired Children: There's Pumpkin Pie, Pumpkin Cheesecake, Pumpkin Soup, Pumpkin Bread. There's Pumpkin Muffins, Pumpkin Juice, Roasted Pumpkin Seeds . . . There's Pumpkin Pie, Pumpkin Cheesecake, Pumpkin Soup, Pumpkin Bread. There's Pumpkin Muffins, Pumpkin Juice, Roasted Pumpkin Seeds . . . It's not a proper farewell to summer without visiting the Alaska State Fair. And it's not a proper visit to the Alaska State Fair without swinging by the exhibit of freakishly huge vegetables. 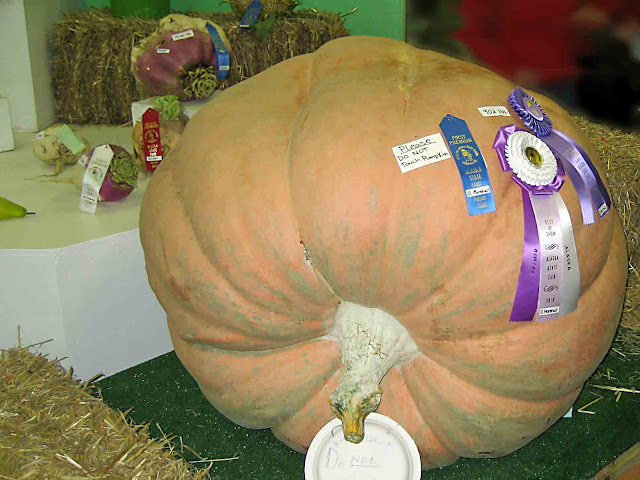 This pumpkin was just barely bigger than me, weighing in at 902 pounds. If only I would have eaten one more corn dog. That is positively monstrous! I have never been to a state fair. I need to fix that! What do you think they do with those big prize-winning vegetables afterwards? I wouldn't think they'd be particularly edible. We get the county fair here, though thankfully not during our otherwordly, Africa-hot summers. They don't usually have the giant veggies, just the side-show, freakish animals. I'd take a giant pumpkin over a two-headed goat any day. Because I'd eat the planetary pumpkin, but not the two-headed goat. Too much guilt. My daughter's boyfriend thinks that giant vegetables are the answer to world hunger. I wonder if he's on to something? Holy cow! We just planted our pumpkins. It's still 104 here. You can laugh now. I bet those seeds are huge too. I love roasted pumpkin seeds. I love the vegetables. Can't imagine all that I could bake with it... oh, pumpkin is my favorite! I'm always so amazed at giant vegetables. I also always find myself wondering what the heck they do with them later. Because, the bigger they are, the less flavorful, right? Seriously? Is there radiation involved in these things? at the Indiana State Fair, they would have tried to Fry a pumpkin, so count your blessings!